The peso oro is the currency of the Dominican Republic . Coins were introduced in 1937 in denominations of 1, 5, 10, 25 centavos and ½ pesos with small numbers of 1 peso coins first minted in 1939. The full name of the currency has never appeared on coins, only “peso”. 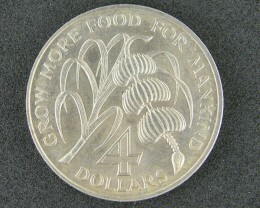 Base metal replaced silver in the higher denominations in 1967. Since 1991, coins of denominations of 5, 10 and 25 pesos have been introduced. However, due to chronic inflation, coins below 1 peso are now rarely found.